Meditating is acknowledging and observing whatever happens – whether pleasant or unpleasant – in a relaxed way. Meditating is watching and waiting patiently with awareness and understanding. Meditation is NOT trying to experience something you have read or heard about. Just pay attention to the present moment. Don’t get lost in thoughts about the past. Don’t get carried away by thoughts about the future. When meditating, both the mind and the body should be comfortable. If the mind and the body are getting tired, something is wrong with the way you are practicing, and it is time to check the way you are meditating. Why do you focus so hard when you meditate? Do you want something? Do you want something to happen? Do you want something to stop happening? Check to see if one of these attitudes is present. The meditating mind should be relaxed and at peace. You cannot practise when the mind is tense. Don’t focus too hard, don’t control. Neither force nor restrict yourself. Meditation is not difficult, but it is difficult to have it the way we want. When we practice, practice very simply. If we notice the idea that we think the practice should be a certain way, please notice that idea – it is an unnecessary and useless idea. It’s a construct we put on our practice that is totally unhelpful and impossible to achieve. We don’t need it. Try not to be caught in it. Right attitude is not wanting something, not rejecting something. Whatever we do - when we speak, when we act, when we think – there are attitudes behind our behaviors, we want to know what they are. A yogi related how he sat and watched pain for one hour. The pain came, increased and decreased and repeatedly increased and decreased. He said that his meditation was going in circles. The yogi didn’t notice that he was meditating for 1 hour, that he was aware for 1 whole hour. That’s the difference between wrong and right attitude. It’s the different perspective of the same situation. Wisdom sees what is happening; wisdom sees the work that is being done. The defilements look for the result. That yogi sat for the whole hour hoping for the result that the pain will go away. He thinks that it’s meditation if the pain goes away. But that is wrong attitude and wrong view. And when there is wrong attitude and wrong view, when the greed cannot get what it wants, then the mind is disappointed. But when there is right view and right attitude, the person sees it from the perspective that work has been done, awareness has been continuously there. When the person sees that this is meditation, he is encouraged. If you don’t know why meditation is good; then delusion says that a particular time, place or posture is good for meditation. Whatever that the mind says is good for meditation IS not right, it is nonsense. Delusion decides because you don’t understand why your meditation is good, or why it is bad. 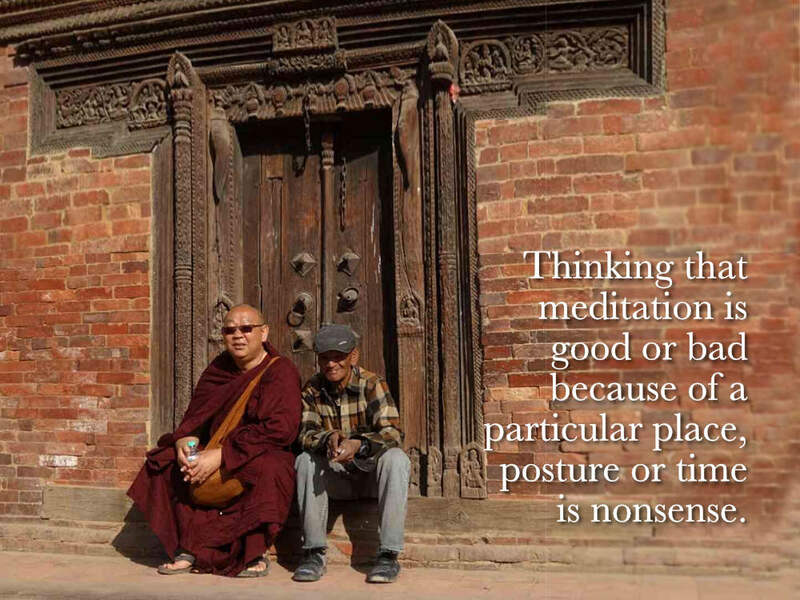 Thinking that meditation is good or bad because of a particular place, posture or time is nonsense. They are not related to meditation – time is time, place is place and posture is posture. For someone who understands why meditation is good, any place, any posture and any time is always good for meditation. Meditation is good because of right attitude. Because of right attitude, any place, posture and time is always good for meditation. At SOM, many meditators take a shower whenever meditation is not good; they make the body and mind fresh, then meditation becomes good because the mood changes. However, it is the mind process that is more important, not external things. The main thing I want to bring to yogis is the idea of right attitude which is right view or wisdom. When we have right attitude, that itself is such a relief. Remember that if we have right thought, right attitude, right idea or right view, we will instantly feel relieved. That’s why it is called right, or wise or skillful; then we get relief instantly. In the beginning it is not possible to have continuous awareness, because it hasn’t become a habit yet. When it is lost, go back again and again to being aware. If there is an adverse reaction to the wandering mind, then recognize the emotion as an object. Whatever happens, recognize it as an object. We should not try to stop the emotion; our responsibility is not to create or resist anything. What we can do is to have right attitude and be aware. When you’re busy, it is easy to lose awareness because of eagerness to do something. When there is no eagerness, awareness doesn’t disappear. You need to learn about your eagerness first, slowing down your action is not important. Be aware of the eagerness; then naturally the eager mind decreases. Awareness is lost not because of doing things fast, but because of eagerness to do something. So, what is important is not to slow down your action, but to change the state of the mind. A yogi suffered from chronic bodily pain. It was only 6 months later that she understood that certain thoughts sparked aversion to the body sensations. When the mind said “just be aware”, then the pain dropped. Sayadaw: The pain dropped because of right attitude. The mind has already realized that thoughts cause pain and it has identified that as negative. It wasn’t simply watching anymore. It is like: this is not good; it shouldn’t come. Then it is creating more blocks. Once you can watch objectively again, then you become free of the aversion. Attitude is so important. When we have the right attitude everything works. When we have the wrong attitude, nothing works. It’s like a formula; if you’re practicing and everything is smooth sailing, it means right attitude is there. If you’re practicing and everything is not easeful, then one of the defilements – greed, aversion or delusion – is present. Search for it. The main culprits may appear to be aversion and attachment, but why do we have them? Because of delusion – we don’t truly understand so we grasp or push away. It’s only when we have strong suffering that we practice seriously. It’s like a harsh teacher. Just carry on. Because it thinks, therefore it is mind. That is the definition of the mind. Initially when you observe thoughts, you will only see the story, what the mind is thinking about. That is the concept. But if you keep observing thoughts and go back to the body over a long time, you will start to see the mind that is thinking – that something is happening – and that is the mind. You will begin to understand its nature. Then you will see the difference between the concept which is the story in the thoughts and the reality which is the mind that is thinking. It is very important to know thinking mind. When you want to examine your attitude, whether right or wrong attitude, you have to look at the thinking mind because your attitude is talking to you through your thoughts. And when you look at thinking mind, you will see the motivations behind those thoughts. Thinking and feeling are not defilements. Defilements are just defilements. They might propel the thinking or the feeling but they are not the thinking and the feeling. Thinking and feeling are just functions of the mind, the defilements work through them and so does the wholesome mind. It is very important not to have a negative view/ idea of the thinking mind. Always remind yourself that the object is just the object. It is not good or bad. It is just an object to help you to be aware. Even if you don’t observe the thinking directly – say you are watching your body sensations and you know that the mind is thinking, that’s enough; so long as the mind continues to know that there’s thinking . Even as we observe thinking mind, we can understand nature, we can understand anicca, dukkha, anatta. All these can be understood by observing thinking mind itself. Why would we want to stop the thoughts? If we don’t think, we can’t do anything. You won’t even know how to eat. Yogi: I made an adhitthana (determination) to have right attitude. Sayadaw: Be careful that the desire to have right attitude can be wrong attitude. You know the meaning of adhitthana, it is determination which of course brings on the energy. Don’t try to have right attitude; recognize wrong attitude. That’s more honest in the moment because wrong attitude is coming so easily. However, this statement “it is not a meditating mind when defilements are present” is contentious, because the sense it gives is that we think we shouldn’t have them. But the reality is that we do, although ideally the meditating mind should be free of greed, aversion and delusion. Maybe the sentence is not well constructed, but it is to help us to recognize when we are using greed, aversion and delusion in the practice. It may have been better phrased as: If greed, aversion and delusion are in the observing mind, notice that there are greed, aversion and delusion. That’s probably a better way to say it than to say: It’s not a meditating mind when the defilements are present. What I’m concerned is that sometimes yogis practice and they don’t notice that they’re practicing with greed, aversion and delusion present. For example, we don’t notice that we have this subtle expectation and that subtle resistance because we’re so fixated on the object that we forget that we’re striving with these energies. When that happens, we continue to wholeheartedly strive with defilements – expecting something or making it go away. Sometimes people do it for years unless it is pointed out to them. Check feelings and thoughts. If you have negative thoughts, it means that you’re still angry. That’s why we need to check feelings and thoughts. If the angry feeling totally becomes zero, the thought also changes, the whole mental state changes. You can feel something totally opposite change. Suffering gone and peace comes, like this. So check. Yogi: My practice is disciplined and I sit through discomfort and stay with whatever is going on. But with this relaxed approach of just noticing, I’m a little lost. I don’t know how to transition. Sayadaw: The purpose of this practice is different – to understand what is going on and not to sit through things. First, change your attitude; you need to have more space to look at whatever is there because you’re not bulldozing through meditation. Second thing is that what you want to observe is your mind’s reaction towards the pain, not so much the physical pain. Investigate how your mind is reacting to the pain. That’s where the learning is going to happen. Because the purpose of meditation is to understand the nature of what is happening as it is, you cannot know the true nature of something unless the mind is equanimous. So if there’s a reaction in the mind when watching pain, then you’re not seeing the true picture of what pain is. Therefore you need to watch the reaction so that you’ll know when there is no reaction. And when there’s no reaction, you can go back and watch the pain and see what it then represents. And you’ll see how the reactions in our mind color our experience. You’ll begin to see clearly that when there is a reaction like discomfort in our mind, there is a certain perception of pain, and when there is no reaction, how the pain looks differently. It applies to all other objects – whenever we have attachment or aversion towards an object, we don’t see its true nature, and we don’t see things as they are. ◉ ARE YOU WILLING TO CHANGE? The important thing is to continue to practice – this is our aim. You learn to practice the right way and continue to apply it in daily life because it is a learning process. Meditation is for life, not for a short time because our mind is not changing yet – 10-day practice, 10-day change. If you practice the whole life, then your whole life will change. We need to change our old pattern because we have lived with delusion for a long time; so this old pattern is very strong. We need to change this pattern right side up. Mental, verbal and physical actions must change, must be led by wisdom so that your daily and spiritual life becomes more mature, more meaningful. Delusion likes one idea – that the retreat is finished. That’s why I see that yogis are very happy at the end of a retreat. Delusion is very happy with the idea that “Meditation is finished” because when meditation stops, it’s delusion’s turn to play. Meditation means cultivation and cultivation means continuity of practice; growing continuously, little by little. Actually when our body is sick, we need to medicate. When the mind is sick, we need to meditate. Where is the mind more sick: in the centre or in your home? In the centre, you can meditate right? So you cure your sickness in the centre. You need to meditate more at home because that’s when you are angry, when you have craving, when anxiety and worry happens more. A lot of lessons for gaining spiritual urgency here. The main lesson to learn and remember is that we are going to die ourselves one day. So before we die, practice; practice like there is no tomorrow. We practice so that we can learn to die peacefully. In Buddhism there is the concept of samsara, which is the relentless, the never-ending, the beginning-less existence where things are cycled over and over again. You can imagine samsara and how long it might be. And because samsara has been so long, we have accumulated all sorts of kamma, good and bad, and they are all waiting to be expressed. So, although there is good, there is also the potential for bad. But we don’t know which will be expressed when. What we need to develop now, because we have the ability to reflect on this, is to build the resilience and understanding to face any bad situation that we might have to face in this life, whenever it might come up... like death.